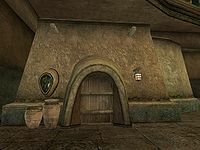 The St. Olms Haunted Manor is a seemingly abandoned house located in the southeastern corner of the St. Olms Plaza in Vivec, but actually serves as a hideout for the House Hlaalu councilor Dram Bero and several other members. The initial room evokes a creepy and gloomy atmosphere, with a few pulsing lights and strange noises coming out of nowhere. The bed there is owned by Dram Bero, but you are free to use it. There is a journeyman's probe, journeyman's lockpick, and a master's lockpick hidden underneath the table in the southwestern corner of the room. The locked wooden door downstairs leads to the basement. The entry hallway of the basement offers nothing of interest. However, there are three rooms connected to it. In the northeastern one resides Dram Bero and Omesu Hlarys. There is a dresser and a closet containing expensive and extravagant clothing, respectively. On top of the dresser are copies of the books The Pilgrim's Path, Saryoni's Sermons, and Homilies of Blessed Almalexia. There is also a double bed owned by Dram Bero and four violet coprinus plants. The opposite room, in which Bero's champion, Garding the Bold, lives, has a variety of different containers with an assortment of ingredients, cheap foodstuffs, weapons, and gold. Some have a slight chance of containing special or marksman loot. In the northwestern corner of the room is a locked wooden chest holding a leveled enchanted weapon. The third room, in the southwestern corner, has a dresser and a closet containing random expensive clothing, as well as a bed. Two cloth sacks there contain cheap foodstuffs and two baskets have a little chance of containing special or marksman loot. It is inhabited by Arvela Falas. This location is depicted on the Haunted Manor card in Legends. This page was last modified on 7 October 2018, at 22:07.